Mr. President was challenged to help Miele significantly increase brand awareness - specifically with high-end kitchen appliances which exist in a premium market dominated by the fancy, but not particularly functional, Gaggenau. The kitchen buying journey is a long and complex one, so we needed to develop a single-minded idea that would tell a consistent story across all customer touchpoints and set Miele apart from their more showy competitors. Our story was rooted in our belief that kitchens are never more beautiful than when they are being lived in. A belief that we wanted to bring to life in the kitchen design discussion, establishing Miele as the premium choice for its professional function as well as its beautiful form in the home. Discovering that top chefs chose Miele for their own kitchens, we developed an entire ecosystem of content and advertising through our “Chef Inspired Kitchens” campaign. The first iteration featured Monica Galetti, Sven-Hanson Britt and Anna Hansen of The Modern Pantry. A series of films and articles charted a customer’s journey with their architect through the design process. It was broadcast across independent cinemas within the M25, tightly targeting our wealthy audience across London. The content series also continues to live across many digital touchpoints. Not only did the films generate an incredible 2 million completed views online but traffic to the hub increased by 150% over benchmark. For the second series of Chef Inspired Kitchens we turned the camera on our own creative partner, Laura Jordan Bambach. 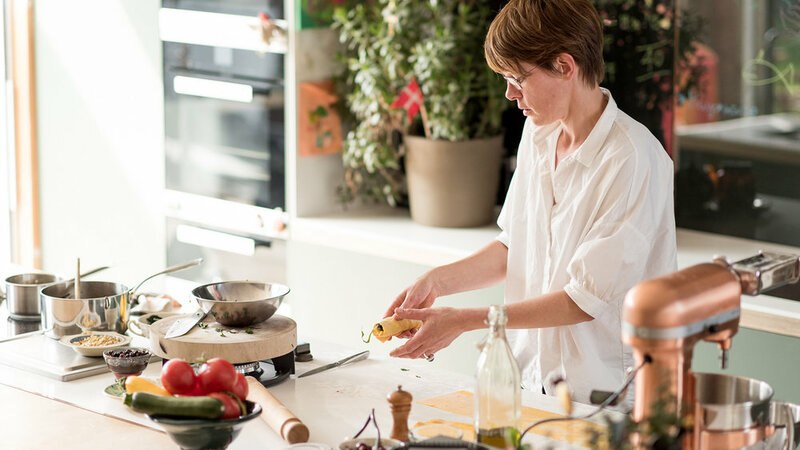 She and her husband, Dan, meet chefs Douglas McMaster and Anna Hansen to share recipe inspiration and discuss using Miele appliances to cook with precision. The experiences with the chefs helped them choose which appliances to have in her new kitchen. Once again, just under a third of all those served the videos watched right through to the end. Since we first began our relationship with Miele unprompted brand awareness has almost doubled from 13% to 24%. Astronauts attach patches of velcro to the inside of their helmets so they can scratch their nose on space walks. Get insights and updates delivered to your inbox. Mr. President is an independent London creative agency with Brand Defining Ideas. Copyright © Mr. President Partnership 2018. All rights reserved.